Monmouthshire Golf Club01873 852606work Golf - 18 holeThe Monmouthshire is a course that suits all levels of golfer and indeed all ages. The course is set against the beautiful scenery of the Usk valley. It is surrounded by the Blorenge, Sugar Loaf and Skirrid Mountains. It is a superb example of a mature parkland course which, from the back tees can be as tough as it is beautiful, and it is said to be the oldest 18 hole golf course in the County of Monmouthshire. The River Usk runs alongside the 6th hole and it is bordered by agricultural land which gives a real country feeling. It has 6 challenging par 3s and interesting par 4s and 5s. The design of the course makes it easy to play a full round or as few as 3 holes after work. The membership is well established but we are happy to welcome new members and many visitors return on a regular basis. It is centrally located for a golf holiday in Wales. Country Membership is available if you live more than 10 miles away and are a full playing member of another club. So why not make the most of this opportunity? The Club has various active sections from the Juniors to the Veterans and an active Ladies section. Also Team golf is keenly contested. There are the usual medals, stablefords etc and also informal competitions known as 'Swindles' so it is easy to find a game. 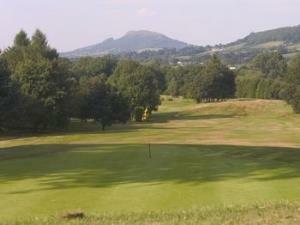 The Monmouthshire is a course that suits all levels of golfer and indeed all ages. The course is set against the beautiful scenery of the Usk valley. It is surrounded by the Blorenge, Sugar Loaf and Skirrid Mountains. If you are looking to join a golf club, enjoy a short break, or a day out as a visitor then the Monmouthshire is happy to welcome you.